The makers of Alia Bhatt starrer Raazi recently released the song Dilbaro. The song has been composed by Shankar Eshaan Loy, written by Gulzar and sung by Harshdeep Kaur. 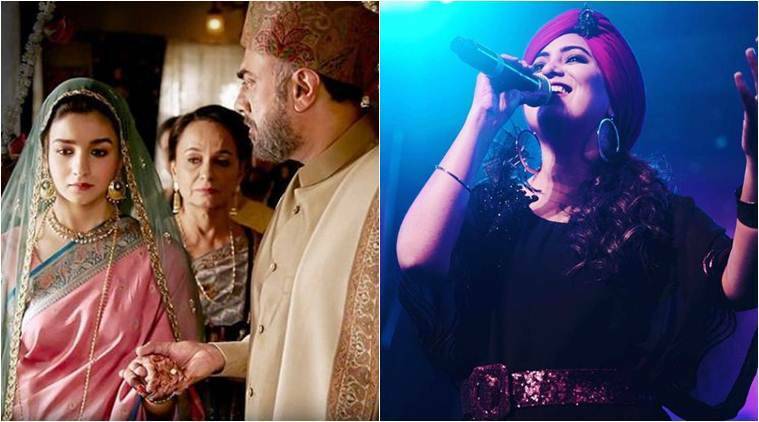 Harshdeep Kaur has crooned Raazi song Dilbaro starring Alia Bhatt. The makers of Raazi on Thursday released the second song from the film titled Dilbaro. The song has been composed by Shankar Eshaan Loy, written by Gulzar and sung by the very talented playback singer Harshdeep Kaur. In an exclusive interview with indianexpress.com, Harshdeep talks about Dilbaro, Alia Bhatt, Gulzar and last but not the least, Shankar Ehsaan Loy. Dilbaro is a song about the father and daughter bond. What sort of bond do you share with your father? People come to me and tell me about my bond with my father. They tell me we look like best friends. He was the one who discovered my talent and he has taken me to places, be it recordings or shows. Even now, he travels with me on my tours. He encourages me. He taught me basics of music. We are more like friends. We discuss everything with each other. I am his ‘laadli’. Our bond is so popular that if someone asks me how I am, the next question has to be about my father. What is your understanding of the term Dilbaro? Dilbaro means beloved. It can be anybody. In the song, it is the father. Did Dilbaro remind you of the moment when you were leaving your parents’ house and heading towards a new life? During my bidaai ceremony, jab end me rona-dhona hota hai and everybody comes and bids goodbye to you. At that moment, I was looking for my dad. It was a very emotional moment. I did not want anyone but him. That particular moment always makes me emotional. The song automatically took me back to the moment. When I read the lyrics and heard the song, I was reliving my bidaai moment, which helped me to emote in the song. It’s an emotional song. What was your first reaction to it? Shankarji called me. He asked me if I can record a song. He wanted to check my scale at first so he hummed the song. He did not sing lyrics but only the tune. The tune was so melodious. When I went to the studio and read the lyrics, I was blown away. Also, certain tunes have become rare these days. It is a beautiful composition and it’s there to stay forever. It will be the bidaai anthem. I felt the song was made for me only. This is yet again a composition of Gulzar who wrote your hit track Heer too. Do you expect Dilbaro to become yet another hit of your career? Yes, of course. This is my first duet with Shankarji. He has taken the song to another level. For me, tune of the song is supreme and then comes the lyrics. Tune is the king. If tune is not good, the song might fail. Dilbaro gives you goosebumps and it will definitely match up to Heer (Jab Tak Hai Jaan) level. Are you a fan of Gulzar like all of us? I absolutely love Gulzar sahab. It is an honour for me to sing his lyrics. I am extra conscious when I sing his composition because I do not want to mess up the pronunciations. The way he describes, it is so visual. It is a regular bidaai song but it stays true to the concept of the film. Like when she sings “Dehleej paar karade”, she also means that she is going to some other country as a spy. It has deep meaning to it. Gulzar sahab is a master in bringing emotions with so much ease. As a singer, did you get the liberty to give your inputs? Collaborating with Shankarji is too much fun. He teaches you the song. I am very particular about things. So, if he would sing thrice, I would ask him to sing 10 more times. He would make me sing entire song in one go even if I make mistakes. You keep singing the song till you master it. He keeps praising you, encouraging you and motivates you to do better. As he himself is a singer, he knows the stress a singer goes through to deliver the best. The recording process is very natural with him. Dilbaro is picturised on Alia Bhatt. Do you think she did a good job? Alia Bhatt is a treat to watch on screen. She is the best actor of the present lot. Her eyes do the talking. She is such a powerful actor that she does not need to deliver dialogues. Her expressions are enough. She looks so beautiful. Since we are experiencing a time when regional cinema and songs are becoming popular across India, is there a language or genre you want to explore? I enjoy music. Language is not a barrier. I do not have a particular reason to why I would choose a different language. I enjoy the beauty of it and the process of learning the language and the culture. Yes, I would love to sing in Bengali. I have done a few songs but would like to explore more. Same goes for Tamil. What’s next for Harshdeep Kaur fans? I am working on my singles right now. Bollywood music has always been my first love because in India, it is the biggest platform with huge reach but sometimes, there is a certain kind of music you want to present to the audience. So that I am doing with my independent music. I do a lot of concerts, which is a different experience altogether. Any message for fans/music lovers? The kind of music releasing these days, I think we don’t care about what we are giving to the audience. Earlier, there was quality. It should not fade away. As listeners, we have responsibility to give ourselves and our future some good music to cherish. Encourage good music, poetry and lyrics.